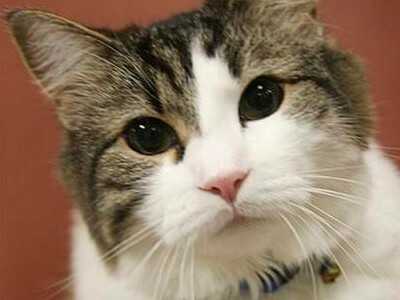 The story of Oscar, the “Death Cat”, is making the rounds these days. From articles in Discover and the New England Journal of Medicine, to an episode of House to a recent posting on this Danish death-related blog, AND a newly published book, this cat gets around—but only if you’re about to die! Oscar is a therapy cat who currently resides at Steere House Nursing and Rehabilitation Center in Providence, Rhode Island. His special (and for some, disturbing) talent is seeking out and curling up on the beds of terminally ill patients near death. Then, as soon as they’ve passed, he jumps off the bed and disappears. Some say the cat is able to smell certain ketones in the blood that are released during the pre-death process. It is similar, they say, to the reported cases of cancer smelling dogs. Others think it’s just a coincidence or that he just likes to snuggle up with the heating blankets often present on the patient’s beds. I tend to think that Oscar is indeed aware of something beyond human detection. I don’t think it’s that hard to believe that their olfactory senses are so sensitive as to detect almost infinitesimal chemical traces in humans. Think of cadaver or drug-sniffing dogs, for example. Smell is such a powerful sense in both humans and animals—although we humans are like a brick of rock compared to the finely tuned nasal capacity of certain animals. Fun facts: Bloodhounds have over 300 million olfactory receptors and the average house cat has about 200 million receptors. Humans have a mere 5 million (New Scientist). And for more about smell, check out The Smell Report by the Social Issues Research Centre. But why does Oscar feel compelled to lay with the patient? Is he trying to comfort the dying? Or is he just trying to send a message/warning to the living and the dying, that hey, someone is going to die here? Who knows. But I think it’s super fascinating. What do you, dear reader, think? Posted by Kim in Death + Biology and tagged animals, death and smell, pets. Bookmark the permalink.